Join Paul Mitchell, a newly qualified vet, as he embarks upon his first job at Prospect House Veterinary Hospital. Along the way you will meet a multitude of hilarious and bizarre characters with afflictions including baldness, bites and obesity. And that’s not just the animals. Pets in a Pickle is a light-hearted romp that will certainly appeal to animal lovers and provide some genuine laugh out loud moments. Welshman has Paul’s veterinary experiences play out as pun-tastic thematic comedy sketches. The wordplay may be a little cringey at times, but that’s all part of the light hearted and frivolous fun. 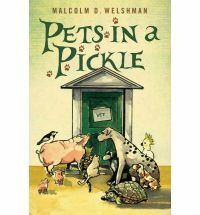 You are currently reading Pets in a Pickle by Malcolm Welshman (Book Review) at booksbeccabuys.